an X-linked disorder characterized by absence of pigment chiefly in the iris, choroid, and retinal epithelium. Other associated findings include foveal hypoplasia and congenital nystagmus. A group of hereditary and congenital, often AR diseases that share a metabolic defect in the production of mature melanin, which translates clinically into hypopigmentation of skin, hair, and eyes–iris See Oculocutaneous albinism type I, Oculocutaneous albinism type II, Yellow albinism. Absence of pigment chiefly in the iris, choroid, and retinal pigment epithelium with deafness; X-linked inheritance. A disorder of voluntary movement, characterized by the inability to accomplish a skilled or purposeful movement, in the absence of motor paralysis, sensory loss or of a general lack of coordination. It is due to a cerebellar disease. ocular motor apraxia A congenital inability to perform some voluntary ocular movements. Children with this condition often use head thrusts to move their eyes to the left or to the right. optical apraxia Apraxia in which there is an inability to copy or to draw in proper spatial orientation. It is usually associated with visual agnosia. Syn. visual apraxia. visual apraxia See optical apraxia. The bottom or back surface of an organ. The term is used here to refer to the posterior portion of the interior of the eye visible with an instrument (e.g. ophthalmoscope). fundus albipunctatus A recessively inherited, nonprogressive tapetoretinal degeneration. It is characterized by a multitude of small, grey or whitish dots scattered throughout the fundus at the level of the pigment epithelium and accompanied by night blindness. The macula is spared and the retinal blood vessels, optic disc, visual field, colour vision and visual acuity are normal. fundus camera See fundus camera. fundus examination See biomicroscope; slit-lamp; direct ophthalmoscope; indirect ophthalmoscope. fundus flavimaculatus A retinal degeneration characterized by prominent, irregular-shaped whitish or yellow flecks scattered throughout the posterior fundi of both eyes. There is usually no loss of vision unless one of the flecks involves the fovea. It is a variant of Stargardt's disease. The electrooculogram is useful in diagnosing this condition. leopard fundus An ocular fundus marked with dark blotches on its surface as a result of a tapetoretinal degeneration, such as retinitis pigmentosa. Syn. leopard retina. ocular fundus The interior of the eye (as may be seen with the aid of an ophthalmoscope) consisting of the retina, the retinal blood vessels and even sometimes the choroidal vessels when there is little pigment in the pigment epithelium (e.g. albinos), the foveal depression, and the optic disc. The fundus appears red, owing mainly to the choroidal blood supply. The colour is lighter in fair people than in darker races and is dependent upon the amount of pigment in the pigment epithelium and in the choroid. In dark races the fundus is almost dark grey (Fig. F11). Plural: fundi. See fundus biomicroscopy; fundus camera; Hollenhorst's plaques; tapetum lucidum. fundus reflex See fundus reflex. salt and pepper fundus The appearance of the ocular fundus characterized by a stippling of dark pigmented spots and yellowish-red spots of atrophy, as is found in congenital syphilis, choroideremia, Leber's congenital amaurosis, rubeola, poliomyelitis, etc. tessellated fundus A normal ocular fundus in which the choroidal pattern appears as roughly polygonal dark areas in between choroidal vessels because the retinal pigment epithelium layer is thin and the choroid heavily pigmented. Syn. tessellated retina; tigroid fundus; tigroid retina. tigroid fundus See tessellated fundus. Abnormally high blood pressure beyond 140-150 mmHg for systolic blood pressure or beyond 90-95 mmHg for diastolic blood pressure. These figures are higher for older people. Elevated blood pressure can give rise to hypertensive retinopathy. 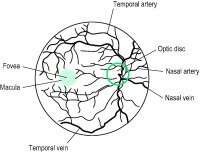 See paralysis of the sixth nerve; paralysis of the third nerve; retinal vein occlusion; sphygmomanometer. 1. pertaining to the eye. 2. eyepiece (of a microscope). see extraocular muscles. See also Table 13.1F. the fold formed by the reflection of the conjunctiva from the eyelid to the globe of the eye. drug delivery devices placed on the cornea or in the conjunctival sac to provide constant release of medication to the eye. The devices may be dissolvable or non-dissolvable. ectoderm which gives rise to ocular tissues. see menace reflex, pupillary light reflex, corneal reflex, consensual light reflex. 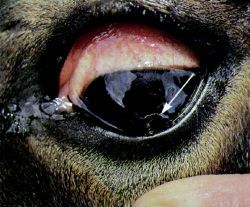 combined ocular and skeletal defects found in Samoyeds and Labradors; ocular lesions include cataract and retinal detachment, the skeletal lesions include hip dysplasia, varus and valgus deformities, and many others. ultrasound examination of the eye is used to detect foreign bodies, intraocular masses, retinal detachment and asterid hyalitis. Especially useful when the cornea is opaque and ophthalmoscopic examination is impossible. Ocular albinism can cause delayed mental development in young children and learning difficulties when they attend school. The Human Fertilisation & Embryology Authority (HFEA)--which oversees all fertility clinics and embryonic research in the UK--is currently considering the gene for X-linked ocular albinism for screening by UK PGD clinics. Subtle disorders, such as congenital stationary night-blindness, cone dysfunction and ocular albinism, can be difficult to detect with ophthalmoscopy alone.